SS fanatic Joachim Peiper led Hitler’s desperate spearhead during the Battle of the Bulge. During the Battle of the Bulge, the largest battle America has ever fought, Hitler chose the Sixth Panzer Army for the German juggernaut’s most important role. 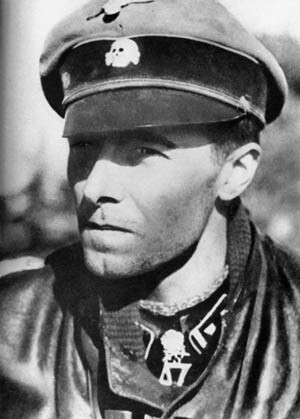 The decisive spearhead was given to a combat group commanded by a young lieutenant colonel named Joachim Peiper. The planning for the Ardennes offensive of 1944 was conducted with such secrecy that Peiper did not receive his formal mission briefing until two days before the assault. When the offensive began on Saturday, December 16, 1944, Peiper’s tanks were delayed by the onrush of traffic and a minefield the Germans had laid down in retreat months earlier. It was not until Sunday that Peiper’s task force reached the town of Honsfeld, Belgium. There it surprised an array of American forces from the 394th Infantry Regiment and 32nd Calvary Squadron to the 801st and 612th Tank Destroyer Battalions. Four German tanks were knocked out, but Peiper captured 15 U.S. tank destroyers and 50 reconnaissance vehicles. The Americans who were not killed or captured were forced into a desperate retreat. Hearing about an American fuel dump in Büllingen, Peiper proceeded there. The town was quickly overrun, and several Americans from the 2nd Infantry Division’s Quartermaster Company and a recon platoon of the 644th Tank Destroyer Battalion were captured. Peiper’s task force also seized about 50,000 gallons of gasoline and forced the American prisoners to refuel the German tanks at gunpoint. When Peiper’s task force arrived south of Malmedy at the crossroads hamlet of Baugnez, it encountered American trucks from Battery B of the 285th Field Artillery Observation Battalion. When the German column opened fire, the Americans abandoned their vehicles in panic. As the men began to surrender, Peiper passed by in his command vehicle. Moving westward, he neared the town of Ligneuville, where General Edward Timberlake and his staff were about ready to enjoy a hot lunch at the Hôtel du Moulin. It was the headquarters for the U.S. 49th Antiaircraft Artillery Brigade, which protected Liege from V1 buzz bomb attacks. General Timberlake and his men were so surprised by the speed of Peiper’s advance that they narrowly escaped capture. Meanwhile, at Baugnez American prisoners were being assembled in a field near the Café Bodarwé. Lieuteant Raphael Schumacker remembered escaping from the Germans with two other Americans. He heard either two pistol or rifle shots followed by machine-gun fire. The two men attempting to escape with him were killed along with many other unarmed prisoners. The SS troopers, according to sworn statements from 21 American survivors, then stepped through the bodies lying in the snow, stopping to shoot those who showed any signs of life. At least 86 Americans were killed and 25 wounded in what became known as the Malmedy Massacre. By Sunday evening, Peiper was near Stavelot. He was confident of reaching the River Meuse the following day. General Courtney Hodges, commander of the U.S. First Army, had good reason to be concerned. Peiper’s advancing task force was about 18 kilometers southwest of the Hotel Britannique in Spa, which served as his headquarters. Between Spa and Stavelot lay two major Allied supply depots containing one of the greatest concentrations of gasoline on the Continent. Depots No. 2 and No. 3 contained more than three million gallons of motor fuel, enough to power Peiper’s panzers all the way to Antwerp. A task force led by Major Paul Solis was sent to Stavelot to assist Captain Lloyd Sheetz of the 291st Combat Engineer Battalion in establishing roadblocks near the Ambléve River. By 3:45 am on Monday, December 18, elements of the 526th Armored Infantry and 825th Tank Destroyer Battalions had passed near the fuel depots and arrived in Stavelot. Captain Charles Mitchell, commander of the 526th Armored Infantry Battalion, remembers, “Major Solis, Captain Sheetz, Lieutenant Doherty, and I proceeded by jeep to Captain Sheetz’s command post near the bridge crossing the Ambléve River. We discussed the situation, and Major Solis ordered my company to defend the bridge…. I was not informed, nor was I aware that the bridge was supposed to have been mined for detonation.” Company C of the 202nd Engineers had quit guarding it before midnight. At 4:30 am on Monday, Mitchell ordered his 2nd and 3rd Platoons to proceed in their half-tracks across the Ambléve River bridge. The 2nd Platoon, under Lieutenant Harry Willyard, made its way up a hill on a road called the Vieux Chateau and established a roadblock and listening post. The men radioed Captain Mitchell with news of troop movement and the noise of armored vehicles. He then ordered them to return toward the bridge. On the way the men encountered some of Peiper’s panzergrenadiers. John Sankey, an enlisted man with the 2nd Platoon, recalled, “There was Germans standing at the buildings firing machine guns at each half-track as they went by.” Two half-tracks from the 2nd Platoon were lost, but Willyard managed to lead the rest back across the bridge. The armored spearheads of Kampfgruppe Peiper came near their goal of establishing a bridgehead across the River Meuse during the Battle of the Bulge. However, pockets of determined American resistance disrupted the delicate German timetable for the advance and caused Peiper’s tanks to burn precious fuel. Anthony Calvanese was shot in the left thigh while jumping from the half-track. Fellow squad member Bernard Gallagher was shot and fell on top of him. “He was huge,” remembered Calvanese. “I had to struggle to get out.” Calvanese dashed into the nearest building and propped his leg up on a chair to dress his wound. Outside he saw flames coming from his squad’s half-track. Calvanese would never forget what he saw next. “There was a German officer, he had a long trench coat on … he’s got a gun. He’s pointing it directly at me.” The German fired his Luger, hitting Calvanese in the left ankle. Calvanese was unable to put any weight on his left leg now and began to crawl for his life. “And along came this fellow, Marcel Ozer. He told me to follow him, which I did. I crawled in back of him all the way to the dairy, where they were using it as a shelter for the civilians.” The Belgians tended to his wounds, hiding him from the Germans. Enlisted men William Kenny, Jim Landgren, and Steve Howell from A Company, 526th Armored Infantry Battalion had crossed the Ambléve River to set up a machine-gun emplacement. “We heard a lot of rifle fire and machine-gun fire,” remembers Kenny. “So we realized real quick that we were in a bad spot. We were between our fellows and the Germans up behind us on the hill.” The trio made their way to the bank of the Ambléve River where Landgren decided to go one direction, Kenny and Howell the other. Kenny and Howell reunited with their battalion. Jim Landgren, who had taken the alternate route, failed to return to friendly lines and was hidden by a Belgian family and later captured. At about 8 am, Peiper’s tanks began their assault. “I listened and I heard a big rumble and I heard them tanks coming down. I knew we could not handle the tanks!” said Mitchell. From across the river, Hauser’s squad aimed its gun at the tracks of the enemy tanks, disabling two of them. “And the guys got out of the tanks. We could see them. They jumped up on the roofs of the buildings over there. So we just started peppering the building, started cutting the building down,” he recalled. Lou Celentano, who commanded the other gun squad, remembered, “We decided to cut down more of the buildings because they seemed to be hiding behind them. We really tore those buildings down. The .50-caliber [mounted on the half-track] did a heck of a job and we were shooting some 3-inch rounds into it and finally cleared it enough so that we started seeing the turrets. Eventually we got so that we had demolished the homes completely and we were able to see the tanks themselves, the entire tanks. So we concentrated on knocking out either the turret or the tracks. The tracks were the best first shot and fortunately we had two great gunners. My gunner was Corporal Roy Ables and Hauser’s was Corporal Paul Lenzo. We managed to stop the first and the last tanks almost immediately…. The second tank was the one that started turning its turret toward us. And I don’t know who hit the turret but he was within a few feet of being able to hit one of us when the turret was stopped and he fired, he actually fired. One shot went completely over our heads…. If he had been able to lower his gun he would have gotten me. I’m almost sure of that. When I say me I’m talking about my crew. But he wasn’t able to get off another shot and that’s when the turret opened up and a man started to climb out. Moving into position to defend the town of Stoumont, Belgium, tanks and soldiers of the U.S. 740th Tank Battalion and paratroopers of the 82nd Airborne Division are confronted by the grim task of stemming Peiper’s SS tide. The shelling took its toll on the German column as witnessed by Karl Wortmann, who commanded a flakpanzer self-propelled antiaircraft vehicle in 10th Company’s Panzer Regiment 1. “It had cost us several panzers and wounded, but the bridge over the Ambléve was open,” he remembered. A Panther tank commanded by Eugene Zimmermann of the 1st SS Panzer Company had been selected by Peiper to lead the attack through Stavelot. In his briefing he was told an American antitank gun would contest his advance. “Noticing a tank approaching the bridge, I alerted Sergeant Smith of the antitank squad,” recalled Mitchell. “We watched as it slowly crossed the bridge,” he said. “Just as it left the bridge, my antitank gun fired, but unfortunately caused no damage.” Three more shots were fired at the German Panther with no effect before it overran the crew’s position. Although the Panther had an excellent combination of speed, armor, and firepower, it was the Tiger that gained the reputation as the most feared tank on the battlefield during World War II. As the enemy armor rolled into Stavelot, a Tiger tank turned on the Avenue Ferdinand Nicolay, where Sergeant Martin Hauser’s gun crew was positioned. Peiper’s column continued passing through Stavelot. “My troops did their best as they fought street by street,” recalled Mitchell. Some of the men from his 3rd Platoon withdrew north on the Francorchamps road toward fuel depot No. 3, the smaller of the two depots in the region holding 1,115,000 gallons of 80-octane gasoline. Evacuation of the fuel had already begun. Fearing that German forces were going to seize the fuel, Belgian guards and men from the 3rd Platoon of Mitchell’s company set a section of the depot on fire. Peiper knew nothing of these depots, and as 124,000 gallons of fuel were going up in flames his main column was advancing toward the crucial bridges of Trois Ponts, where the Ambléve meets the Salm River. As Peiper’s task force lunged for the crossings at Trois Ponts, Company C, 51st Combat Engineer Battalion detonated charges on the key bridges, sending them crashing into the Ambléve and Salm Rivers below. With the favored route now denied, Peiper’s main column detoured northwest to the town of La Gleize and then southwest into the village of Cheneux. With clearing weather, Allied fighter-bombers took to the skies, and as U.S. Republic P-47 Thunderbolts and British Hawker Typhoons struck the German task force, Peiper took cover in an old concrete bunker. German soldiers loot an American camp that has been deserted and overrun. The Ardennes offensive was undertaken without an adequate supply of fuel, and soldiers in the background have located a number of jerry cans. The Germans returned fire with their four-barreled Wirbelwind 20mm antiaircraft guns that were mounted on type IV tank chassis. One P-47 was shot down and eight others damaged. About eight vehicles were hit during the air attack, but the major loss for Peiper was precious time. 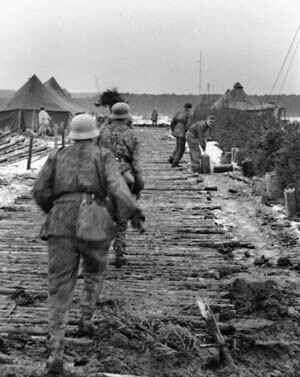 The Allied air attack delayed the German advance, providing time for A Company, 291st Engineers to prepare charges on the Neufmoulin bridge. As the lead Panther approached the bridge over the Lienne River, it was blown in their faces. With no other bridges in the vicinity capable of handling the weight of heavy German tanks, Peiper was forced back toward La Gleize. His fuel was critically low, and a number of his tanks ran out of gas. Belgian observers reported 125 German vehicles including 30 tanks passing through the town of Rahier. Peiper spent the night resting in the Chateau Froidcour just east of Stoumont. Kos and four others traveled by jeep to the area east of Stoumont. The driver stayed behind while the others proceeded through a wooded area on foot until they came upon the enemy from a concealed position. “They were washing up, eating, making a fire, and changing their clothes,” remembers Kos. “There were 30 … tanks there.” Kos reported the findings to his company commander, who relayed them up the chain of command. Hall, who had received a Silver Star while serving in Normandy, looked around for some place to take cover. Without no other option, Hall and the others surrendered. For the actions that followed, Kos would be decorated with a Silver Star, undergo five back surgeries, and receive decades of psychiatric treatment. When German tanks approached the 3rd Platoon’s position, Kos helped direct the fire of two Sherman tanks from C Company, 743rd Tank Battalion. He gave the signal as soon as the lead German tank was about to come around a corner. “So the two Shermans fired at the lead tank, knocked the track off of it and damaged the turret,” said Kos. Gallantly moving through a murderous hail of machine-gun, small-arms, and tank fire, Kos continued directing fire that destroyed two enemy half-tracks. The heroic action delayed the enemy long enough for a new defensive line to be established. 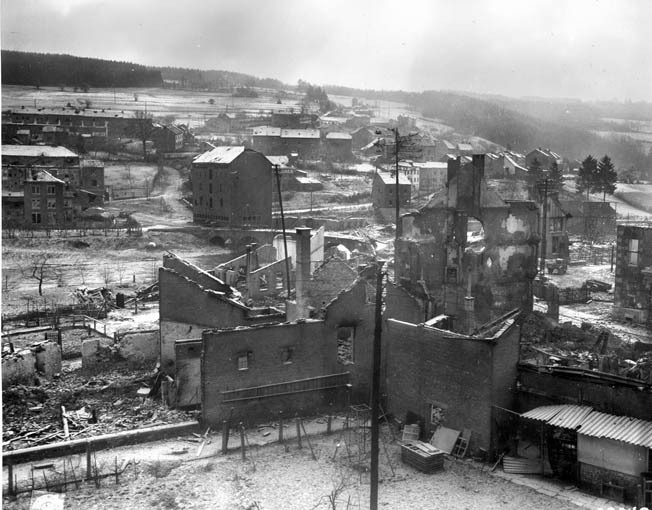 The shattered Belgian town of Stavelot is shown during the Battle of the Bulge. In the center at left is the bridge over the Ambléve River. Kos ducked into one of the houses and went upstairs. “I could see the tank and six Germans, six SS guys coming down the road,” he said. “I knew that if I shot a couple of them, which I could of, that they were going to get me anyway.” When one of the SS troopers came to the front door of the house, Kos decided to escape out the back window of the second floor. The SS trooper threw a grenade into the room, and as Kos opened the window the blast sent him flying to the ground below. As German tanks in Peiper’s column forced their way through the streets of Stoumont, James Pendleton of Headquarters Company placed his allotted antitank mines in the path of the oncoming enemy. He saw a German tank run over one of the mines and burst into flames. When the Germans opened their hatches in an attempt to escape the burning tank, Aldrich and Memphis “took care of them as they crawled out….” With the onslaught of German tanks and infantry pouring into Stoumont, the men were soon forced to take cover in a storeroom with a large front window. 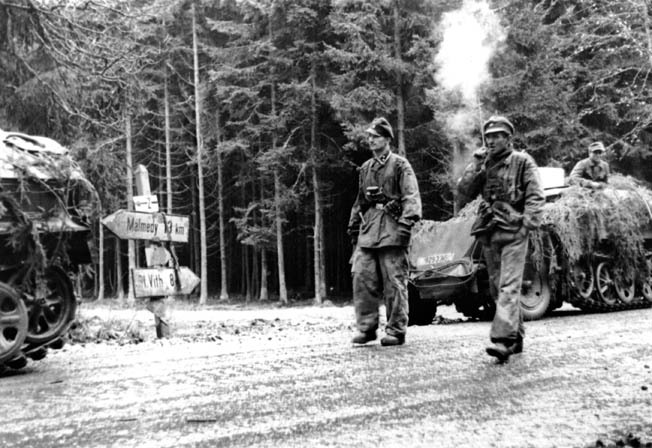 Smoke from his cigar curls upward as an SS officer and his detachment pause at a road sign directing traffic toward the village of Malmedy, Belgium, during the opening hours of the German Ardennes offensive that came to be known as the Battle of the Bulge. In a field near Malmedy, troops under the command of SS Colonel Joachim Peiper committed one of the most infamous battlefield atrocities of World War II. The antiaircraft shell took off about four inches of the radius and ulna bones near the elbow of Pendleton’s forearm. The jeep lost control as it neared a curve in the road and flipped over, throwing its occupants through the air. Aldrich and Memphis scrambled to their feet and managed to take cover behind some bushes. German vehicles and infantry continued through Stoumont. Pendleton leaned against a building to rest and gazed at the street corner where his jeep had overturned. Aldrich and Memphis were nowhere to be seen. Then from around the corner a Sherman tank appeared and fired its gun. The Sherman withdrew and then reappeared to fire again. It continued this strategy for some time, and finally Pendleton was able to attract the tank crew’s attention by leaping out in the middle of the street. The tank continued to maneuver from around the corner. Upon hearing the Sherman’s engine rev three times, Pendleton moved to the location as instructed, and when the tank reappeared the barrel was positioned for him to grab. “I hooked my left arm and grabbed a hold of my belt and he rode me back around the curve,” says Pendleton. “I was suspended in the air on the opposite side of the road from where the Germans were. They sandblasted the tank…. They shot all the paint off of it.” With exhaustion setting in, Pendleton’s grip around the barrel loosened, and he fell to the ground, nearly being crushed by the tank that had just saved his life. The 119th Infantry Regiment’s 3rd Battalion suffered 267 casualties defending Stoumont. Most of the 152 left behind to cover the battalion’s withdrawal were captured. In an ironic twist of fate, that very afternoon one of Peiper’s reconnaissance groups probing a secondary road from La Gleize to Spa had narrowly missed 2,226,000 gallons of gasoline. To prevent fuel depot No. 2 from falling into German hands, a minefield had hastily been laid and Headquarters Company of the U.S. 9th Armored Group had been ordered to provide a radio security net for the First Army. When radio net officer 1st Lt. Walter R. Butts heard enemy activity in the area he requested additional support. The 110th Antiaircraft Artillery Battalion sent in two 90mm antiaircraft guns and four M-51 quadruple .50-caliber machine guns. Peiper’s reconnaissance group of two armored cars, two trucks, and two self-propelled 88mm guns reached a point about a mile north of Cour, near the southern edge of the minefield. Two Germans got out of the leading armored car and walked to the minefield. 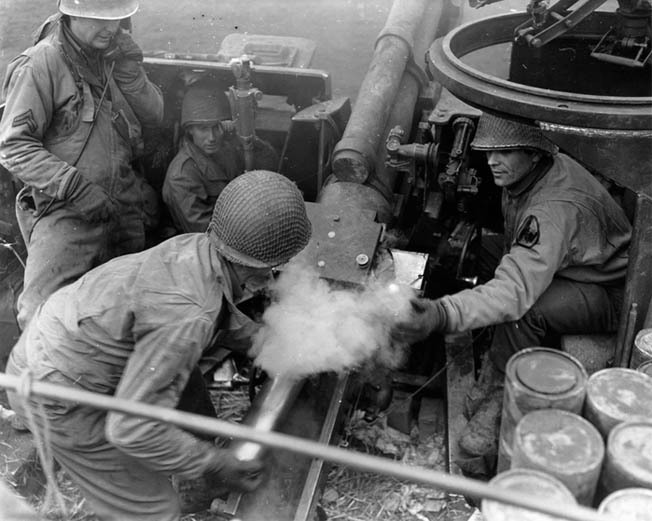 American artillery played a key role in blunting the initial drive by the Germans during the Battle of the Bulge. This photo was taken on December 21, 1944, during desperate fighting to support infantry positions contesting the German offensive. An American opened up with a .50-caliber machine gun, and the Germans immediately returned fire, killing the gunner. Then all the machine guns opened up while other Americans let loose with small arms fire. 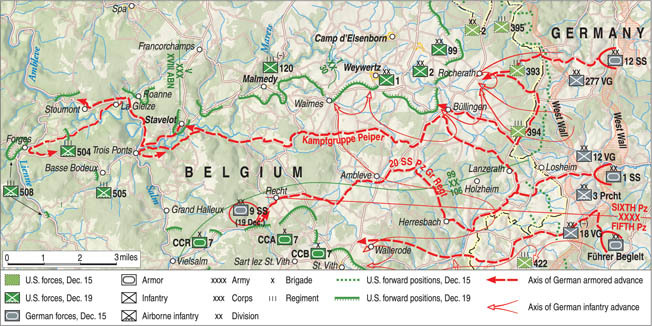 By Wednesday, December 20, Peiper faced his enemy on three fronts. Throughout the day and into the night the main concentration of his forces, spread through Stoumont, Cheneux, and La Gleize, fought off elements of the U.S. 30th Infantry, 82nd Airborne, and 3rd Armored Divisions. Three separate task forces from the 3rd Armored Division’s Combat Command B were involved. Task Force Lovelady was given the important job of cutting off the Stavelot-Stoumont road to prevent supplies from getting to Peiper. Task Force Jordan made a thrust toward Stoumont and was beaten back when two American tanks leading the column were knocked out. When the fog lifted for a short time a German knocked out another Sherman commanded by Lieutenant Wanamaker. When the Sherman advance toward La Gleize stalled, the infantry continued. “We got the daylights kicked out of us, boy we ran into an ambush,” remembers Robert Kauffman who served in D Company, 36th Armored Infantry Battalion. Under the cover of darkness, the men crossed a small narrow bridge and then made their way up a hill. Fighting on three sides, Peiper’s task force was considerably weakened. By Thursday, December 21, Peiper consolidated his forces to the more easily defendable hilltop village of La Gleize. Task Force McGeorge continued to press an attack on the village, making little headway. To avoid the tragedy of forcing Sherman tanks into La Gleize, where the heavy German tanks waited, the Americans relied on artillery. An intense artillery barrage blanketed the town as Peiper established his command center in the cellar of a large house. SS Colonel Joachim Peiper was a ruthlessly efficient officer who drove his armored spearhead toward the River Meuse as rapidly as possible. Late in the afternoon, parties of American enlisted men came to the cellar and removed the dead and wounded; the litter bearers told me that German casualties had been heavy throughout the town. The Germans engineered the most powerful tanks of World War II, but without the fuel to run them they were useless. Between 2 and 3 am on Sunday, December 24, Peiper and about 800 of his unwounded men walked out of La Gleize. Most of the vehicles they left behind were out of fuel. On Christmas Day, elements of the 740th Tank Battalion recovered an unwrapped gift, a Tiger II left behind by the 3rd Company of Peiper’s 501st SS Heavy Tank Battalion. It was shipped to the United States and examined at Maryland’s Aberdeen Proving Grounds. The tank was later displayed at the Patton Museum in Fort Knox, Kentucky, and now rests in a warehouse at Fort Benning, Georgia. Tags Aberdeen Proving Ground, Allies, Axis, Battle of the Bulge, Courtney Hodges, European Theater, German Sixth Army, Hawker Typhoon, Heinrich Himmler, Joachim Peiper, Kampfgruppe Peiper, Lieutenant General Hermann Priess, Malmedy, Malmedy Massacre, memoir, Meuse, Republic P-47 Thunderbolt, Royal Air Force, Sherman Tank, Stavelot, Stoumont.